Judges will meet tomorrow (Friday) to allocate cash to charities and groups across the Melton borough for this year’s Make It Happen scheme. Dozens of organisations have applied for a share of the bumper £10,000 community pot which has been donated again by Ragdale Hall. Successful applicants will be invited to a presentation evening at the health spa on Thursday December 3.
l Melton & Belvoir School Sport & Physical Activity Network would like £600 to pay for a ‘This Girl Can’ Health and Fitness Roadshow, which is targeted at women aged 14 to 25 to increase their physical activity levels in a social and non-competitive environment. Health and fitness classes would be organised in participating schools..
l The Venue, a youth entertainment centre in Melton, has applied for £800, partly to pay for creative craft sessions for youngsters aged 13 to 17. The rest of the money would go in the activities fund, for film nights, pyjama parties, discos and pool tournaments. l Melton Learning Hub wants £500 to buy additional tools for their construction and mechanics facilities, where its most popular courses are taught. The hub is a charity which helps youngsters who have become disengaged with learning, through exclusion, family problems or special educational needs. l Barkby United Cricket Club has applied for £1,000 to help pay for a new bowling machine to replace the old one which doesn’t now work. The village club, which has 70 juniors aged eight to 16 and 60 senior players, has just been promoted with six former junior players. l Organisers of the Melton Royal British Legion Poppy Appeal would like £500 to provide prizes for an annual golf tournament, which raises money for its cause. l Parents’ Solution Circle, a parent support group which meets fortnightly at Birch Wood Special School in Melton to chat, have coffee and work together in resolving dificulties, has applied for £400. 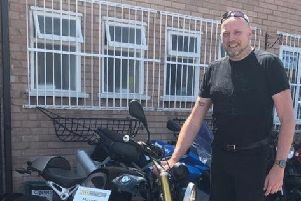 The money would help with rising running costs and to buy equipment to help support the parents and carers of children and young adults with special needs and/or behavioural problems. l Dove Cottage Hospice, at Stathern, would like £725 to buy a special hoist to assist carers in transferring guests with greater safety, comfort and dignity. l Melton & District Furniture Project has applied for £300 to pay for volunteers to have a Christmas lunch following county council funding cuts. l Friends of Gretton Court want £500 to buy planters, raised beds and a potting table to go in a new sensory garden for use by elderly residents, carers, family friends and staff. l The Parish Community Hub has asked for £300 to continue its popular monthly rural lunch project which provides an opportunity for people from small rural communities to eat together in villages south of Melton. It focuses on those who are isolated, lonely and vulnerable. l Melton Computer Club has applied for £300 to help pay for a portable digital projector for monthly club presentations to replace the 11-year-old machine which now has insufficient resolution for live demonstrations.